Snowshoe or trekking poles aren’t necessary, but they can be incredibly helpful when learning, balancing, or navigating difficult terrain. If you want to get into an outdoor winter sport, snowshoeing is an inexpensive option that offers a lot of fun for all ages. No prior experience is needed to get outside with a brand-new pair of snowshoes and start trekking. As long as you have a good pair of winter boots and warm outdoor clothing, you don't need any other gear to get started. Modern snowshoes have lightweight metal or plastic frames that make them comfortable and easy to maneuver even in difficult conditions. By spreading your weight out over the frame, snowshoes allow you to traverse fluffy snow or icy hills. Snowshoes can handle a range of winter conditions, but they work on some snow types better than others. Powdery snow proves a challenge for most snowshoes, but deep drifts aren't an issue for wider shoes. Snowshoes vary in design and features, so it's important to know how and where you intend to use them. Each of these components varies in material, style, and durability, so it's important to choose snowshoes that fit your needs. A snowshoe is made up of several parts that work together to keep you "floating" over the surface of the snow. Frame: This is what gives the snowshoe its shape. It's typically made of aluminum or composite plastic. The front of the frame is usually rounded to allow for smooth movement. Decking: This is the material inside the frame that does most of the work of keeping you afloat. Binding: This is what keeps your foot in place and can be either a strap or step-in binding. Hybrid binding systems provide comfort and control, especially on steep or difficult terrain. Before you head out into the cold, try your bindings on at home and experiment with different adjustments to find one that is comfortable while still offering control. Crampons: These are metal teeth that dig into ice and snow and prevent you from sliding on inclines. Any snowshoes can handle packed trails, but shoes fitted with good crampons can handle icy inclines. Durability: The durability and comfort of your snowshoes are two of the most important aspects. Composite plastic frames tend to be more durable, but plastic bindings are more likely to break eventually, especially in extreme cold. Terrain: Most snowshoes are designed for a specific type (or types) of terrain. Snowshoes for flat ground are a common choice for beginners, children, or anyone just interested in a winter stroll. Snowshoes for rolling terrain have more aggressive crampons for gripping snow and slopes. These shoes also have sturdier frames to accommodate the added weight of a backpack or rucksack. Mountain snowshoes are typically made with composite materials for durability and handling icy trails. Snowshoe prices: Entry-level snowshoes for flat terrain cost between $60 and $100. Snowshoes for rolling terrain cost up to $300. Mountain snowshoes can cost well over $300. Q. What should I wear while snowshoeing? A. It's usually a good idea to wear several layers, with a base layer that wicks moisture well. The outer layer should protect you from wind and moisture. And don't forget decent gloves or mittens and a warm hat. Q. How do I care for my snowshoes? A. After hiking, wipe excess moisture off the snowshoes and hang them up to dry away from heat. A snowshoe bag is the best way to store snowshoes long term. Our take: If you want to buy one pair for any conditions, make it this pair. What we like: With tough overall construction, reliable carbon-steel crampons, and a lightweight design, these snowshoes are up for anything. Customers find these shoes easy to walk in and simple to adjust to a range of sizes. What we dislike: Bindings may loosen slightly in extremely cold temperatures. Our take: Low-priced pair that will meet the needs of most people. What we like: These simple snowshoes handle light snowy walks or hikes. A great entry-level pair. Rounded shape makes maneuvering easy. Limited lifetime warranty is an added perk. What we dislike: Straps can be difficult to fasten. Poor grip means these shoes struggle with icy patches and inclines. 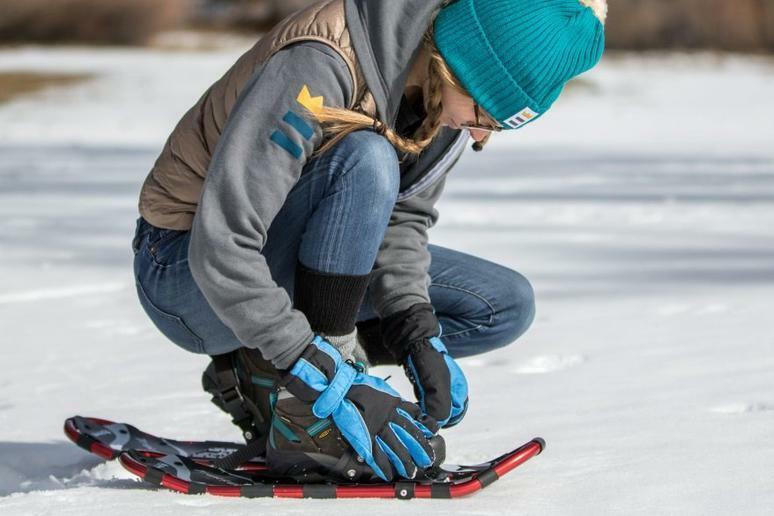 Our take: Lightweight, comfortable snowshoes that handle deep snow well. What we like: Come in a wide range of sizes to fit most people. Included trekking poles are great for beginners. Deep snow is no match for these shoes..
What we dislike: Components have a tendency to break. Little grip. Adjusting plastic bindings is difficult.